Huntsville Restaurant Week has come to an end for 2016. Unfortunately, this was a VERY busy week with the SMD Symposium in town, classes, school, and everything else. Based on everything, I decided that I would focus on lunch for the week. I will say that I was a bit disappointed that some many of the participating restaurants had their lunch prices set at $15 or above. Being a bit “frugal” (OK, so Lori would probably say I’m cheap…. ), my upper limit for lunch was $10. I ended up running through most of my August lunch budget this week. I don’t go out for lunch often as I bring it with me to work, one main reason is that I’ve been working on eating better and losing a bit of weight. So, I decided to to sacrifice and visit some of the restaurants nearby that had a $10 lunch. As I mentioned, the SMD Symposium was in town and Lori was working a booth at the show and I was heading down there, so we met for lunch on Tuesday and walked over to Pane e Vino across Big Spring Park at the Huntsville Museum of Art. The lunch special was a caesar salad, personal Margarita pizza and a cannoli. 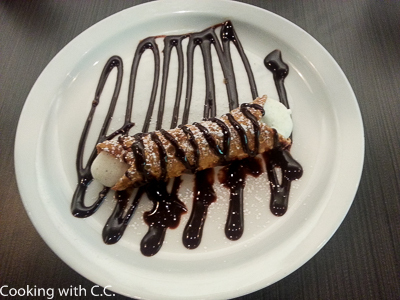 I enjoyed mine, especially the cannoli. Lori thought that the sauce on the pizza was a bit plain and needed more herbs. The only down side was that the service was quite slow. I decided that I needed to try a few places I haven’t visited and wouldn’t normally visit. I saw that a small restaurant around the corner from my office was participating in Restaurant Week. I made the trip there for lunch on Wednesday. The lunch special started with a Barley soup. This was followed by what they describe as “Our popular menu option #5 Jojeh (Chicken) Kabob served with a generous portion of our Homemade Real Saffron Basmati rice, a grilled Roma tomato and a peperoncini.” One of the folks there told me to sprinkle a spice of some kind from a shaker on the table on the chicken. The chicken had been marinated and then grilled. I wasn’t sure what was in the dish, so I looked it up and it’s a saffron and yogurt sauce for the marinade. While it’s not what I normally eat, I did enjoy the food and the flavors. I will have to make a return trip to try something else on the menu. I’ve driven Jordan Lane for years and I’ve seen the smoking trailer behind the Marathon station at Jordan and Holmes for a while and always wondered about their food. Since they were also participating in Restaurant Week I decided to try them out for lunch on Thursday. The $10 lunch special was what they called the “sampler” platter. It included red beans with rice with a choice of sausage and a choice of 2 sides. They suggested that I get the gumbo and jambalaya. For the sausage, I had a choice between smoked, andouille, or hot sausage. I don’t do spicy well, so I chose the safe smoked sausage. I got the plate with the three items on it and while it was very flavorful, there was still some spice in there (at least for ME it was spicy). It was definitely on par with the better New Orleans style food I’ve had in town. They do have a wide menu and with both BBQ pork and brisket, I need to try it again sometime. Drake’s has participated in the Taste of Huntsville several times when we’ve gone to that event, and what they served has always been very good. Since I have to go to my allergy doctor for my shots near Parkway Place Mall, I decided that I would head down that way, get my shot, shop for Saturday’s class and have lunch at Drake’s. They had a $10 lunch special of a BLT side salad, choice of a burger with fries or tots. I arrived about 12:30, so most of the tables were full, but finishing up. You seat yourself, so I picked a table in the front part of the restaurant and sat down. All of the seats were tall stools without backs (I would have preferred something with a back). I ordered my lunch and waited for it to arrive. I really enjoyed the salad – the dressing was a ranch dressing and the whole salad was flavored with the bacon (never a bad thing). I went with the Cheddar burger and also added bacon to it. I really like the french fries – not that many folks still serve the larger fries. The burger was one of the better ones I’ve had in town. They had a wide beer menu and a passable wine menu. With the “table taps,” they are geared up for groups to enjoy the beer selection. After finally trying Drake’s, I will certainly have to return the next time we want to head out for a good burger. I visited 4 place during the day for lunch for Huntsville Restaurant Week – I have been to Pane e Vino before and three spots that were new to me. I’m glad I took the opportunity HRW to step out and push my limits. I found restaurants that I will have to try again in the future. I hope next year that more restaurants participate and those that do participate offer more “value” menu options. Be sure to let me know about any other places you tried during Restaurant Week that I should go visit. On the positive side – I tweeted out pictures of several of the lunches and I won the drawing on Friday for a $100 gift certificate to The Rocket City Tavern which is supposed to open soon. Guess I’ll have yet another new restaurant to try.